Monday to Friday 8:30am - 5:00pm Saturday 8:30am - 3:00pm. 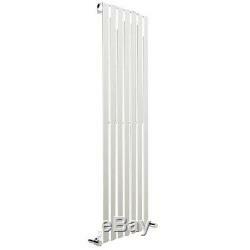 Central Heating Vertical Designer Radiator Flat Panel Chrome/Black/White - Navi. Low Carbon Mild Steel Frame. 3 or 5 Vertical Panels. Chrome, Black or White Finish. UK / EU Heating System Compatible. 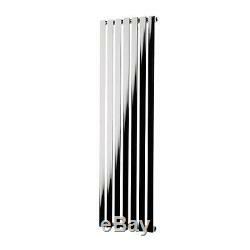 Navi Flat Panel Vertical Designer Radiator - Chrome / White / Black. The Navi flat panel designer vertical radiator is designed to work beautifully with your modern bathroom, kitchen or living space, with many variations to suit all wall spaces and room types. This high output radiator is available in 3 or 5 panel widths (22.4cm - 37.2cm) and 3 colour / finish options; bright polished chrome, matt fine textured RAL9010 white and RAL9005 black and in 2 heights of 1.2m or 1.8m. Tested to the highest standards (BS EN 442, ASTM B117), the superior quality of our radiators allows us to back them with lengthy guarantees. 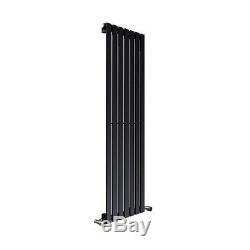 3 or 5 Flat Panels, Vertical Designer Radiator. Bright Polished Chrome Plating - Textured Black Powder Coating - Textured White Powder Coating. Brackets, Fixings, Bleed Valve & Blank Plugs. Four Point Easy-Fix Wall Mounting Brackets & Fixing Kit. Central Heating Designer Vertical Radiators. 1276 - 2126 - 1685 - 2764 - 1557 - 2594 - 2056 - 3372 - 1557 - 2594 - 2056 - 3372. Richmond Radiators Limited 50 Racecourse Road Richmond North Yorkshire DL10 4PB. The item "Central Heating Vertical Designer Radiator Flat Panel Chrome/Black/White Navi" is in sale since Thursday, March 23, 2017. This item is in the category "Home, Furniture & DIY\Heating, Cooling & Air\Radiators". The seller is "richmondradiators" and is located in Richmond North Yorkshire.